All washed and crinkly, ready to go! I made this quilt for Lucy, the daughter of my coworker/friend. She's the first girl in five generations in their family and I knew she was getting spoiled with tons of pink baby things. I wanted to do something different. I was definitely out of my comfort zone on this one...I used orange for the first time in my life! 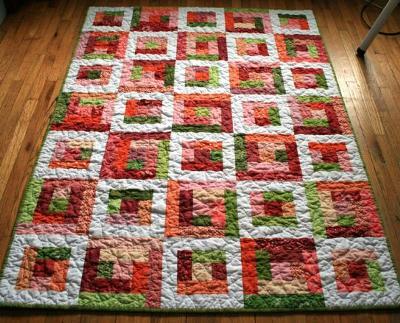 I don't know where it came from but I just had a feeling that this pink/green/white quilt needed orange. I learned a lot about taking chances and instead of being scared, I had a lot of fun. The inspiration was a quilt made by amandajean at Crazy Mom Quilts. Each log cabin block is 8"x8" for a total of 40"x56". It is machine pieced and machine quilted in a large, winding sort of pattern. It's backed with a pink and white polka-dot flannel and I did the binding by hand. I really like. when i first looked at it itreminded me of a toss salad. lol but then i looked again and see very pretty roses. These colors are my favorite. Beautifully done! I really love this, especially the use of orange. I just LOVE this quilt! The colors are beautiful together, and give this quilt a nice, modern, feel, while still being such a traditional pattern. Thanks for sharing!